Last term, on Tuesday 9th December, we had our first ever Everybody Writes day, with everyone in the school (pupils and many staff) writing briefly on the subject 'Christmas Past'. We blogged some of these in the following days. Now, for the next week or so, we are displaying those pieces on large boards all over our Library. They're striking-looking, and visitors to the Library are drawn to them. 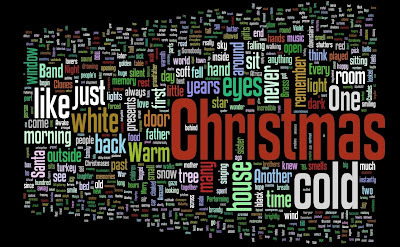 Pictured above, a Wordle of all the words in the pieces (click on it for a closer look).